A lot of things can change in an industry over the course of 40 years, and the machinery and deburring field is no exception. Metal cutting and punching has become so advanced that many manufactures can claim they offer burr-free parts. Laser technology now offers higher capacity and faster cutting speeds. The last 10 to 15 years have seen significant advances in water jet technology. But there's one area that hadn't changed much during the past 40 years, and that's deburring machines. At least until the advent of the Loewer disc machines, which entered the U.S. market several years ago. Most manufacturers still use an abrasive belt in their deburring machine. But it's worth asking: With today's technology being so advanced, and with laser cutting available, do you still need the abrasive belt? Let's think about what an abrasive belt really does: It grinds the metal surface, and removes vertical material, while moving it horizontally into holes creating a sharp edge. It doesn't really deburr anything. Typically, all manufacturers build machines with belt and brush combinations, so the edges can be rounded. But, this design is expensive to build and operate. For example, a 36-inch wide abrasive belt is costly to begin with, and runs off a high horse power motor, which in turn requires a more rigid frame, driving the price of machine up even more. Today's manufacturers don't care about what it costs fabricators to run their machines. Think of it like the auto industry. There was a time when most cars were gas hogs, until automakers began receiving pressure to build more fuel-efficient cars. And now we see a lot more of them on the road. That hasn't yet happened in the deburring world. No one is really paying attention to operating costs, focusing instead on edge quality and the machine price. Take the machines that feature unique designs, such as a cross belt machine. We're sure it does a decent job, but again: At what price, and what operating cost? Knowing what you're getting into before you buy reduces the chance you'll be shocked at the operation costs down the road. A good example would be - machines that require fixturing or expensive vacuum tables to process small parts. Not only are the tables costly, but the conveyor belts on the machines are expensive to replace. In any case, you'll spend four to five times as much to replace conveyor belts for these machines as you would for conveyor belts on the the Loewer Disc machines. Loewer machines can process parts the size of a dime without a special table or additional options. It's all in the design. As you can see, not all deburring equipment is created equally, a point we’ve tried to make here, and with our cost of operation comparison sheet. 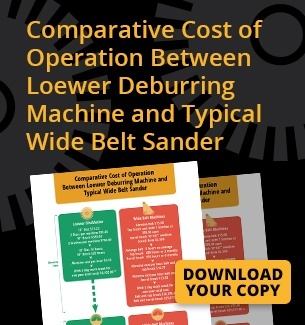 We’ve designed it to allow you to compare the cost of operating a Loewer deburring machine to a typical wide belt sander. You'll see that the Loewer machine will provide significant savings in terms of electrical, abrasives and total operating costs. For more information, please download the cost of operation sheet or contact AM Machinery Sales directly to learn more about how we can provide you with the best machinery for your application at the right cost.